Summer is slowly winding. Where the shade is cool, but the sun is still too hot. I am sure there is a glorious time just before evening when the afternoon sun is warm as I like it, but I forget to experience it, or I cannot.. I am determined to get out of an office rut and live the life. Of sunshine, merriment, of waking,sleeping,eating and walking as I please, and all the time making a good living doing what I love, and making a positive difference in the lives of oh so many people. Insha Allah - God Willing. I love to dream sometimes, and after a long absence of making up new dreams, I initially found it difficult to do so. Now I find how I have grown, how the dreams have mellowed and matured, and yet they are clearer still where they were daring. There are clearer visions of places I want to be, somehow I am no longer into bungee jumping before I got a chance to try it out, somehow I do not want to own a zoo or a building full of persian cats, but I am now wanting to touch a redwood tree, travel the world, stand on a cliff and look down at a valley's treetops amidst the mist, and always, always be able to return 'home'.. to safety,warmth, loving family and friends, good food,good health and humour, good books, good fun and good decor. I have yet to explore Old Lahore , especially armed with a good camera. I have also yet to get a DSLR (Excellent camera, excellent price.. See my dilemma? But a nice kind of one). Any and all suggestions/advice welcome! 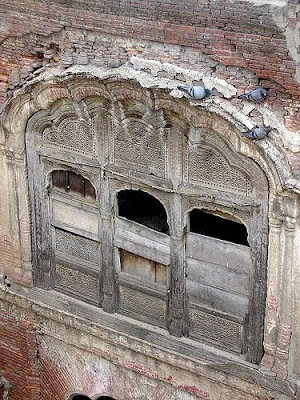 A friend emailed from abroad saying she would be coming in late October (to spend Winter in Lahore) and asking whether I'd be a partner to going around historical monuments in Lahore to take photographs! Am I interested? Yes! Full of crowds,traffic and pollution, Old Lahore would require a certain determination and escorts to explore.. Here is just a reminder of what is still there, may not be for long... old architecture, hardly given a whim.. 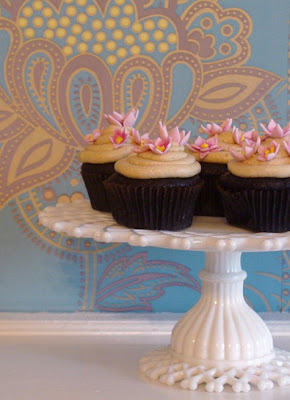 I found these gorgeous cupcakes pictured above, via Design Sponge, and am I glad I tried out the recipe! I'll admit, I came across the recipe while I was fasting yesterday, and had to make them the VERY SAME DAY. The buttercream frosting is delicious, and not to be skipped (note to self: quit skimping-out-frosting-altogether-shortcuts) especially because I cant say I liked the taste of the cake on its own.. I dont know why but the word 'industrial' kept coming to mind when I tasted just the cake. Strange how a word can sometimes come to mind for something unrelated. I am reminded of how when I was in third or fourth grade, my class used to look forward to the chocolate cupcakes that my mom would send at the end of year parties or my birthday. 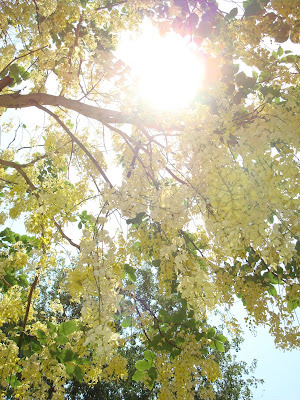 Summer in Lahore brings the Amaltas trees, as they are locally called, into bloom. I love seeing these flowers, especially since few other petals are found in this scorching heat. And flowering trees, I just find beautiful. 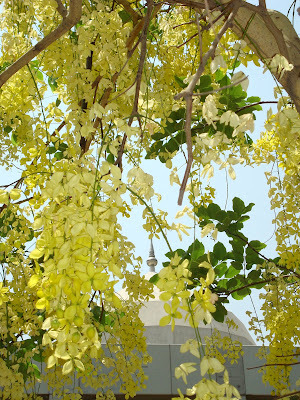 There is a young one planted right outside my house, pleasing us with one branch of blooms this year, and everywhere I see the Amaltas, I notice them. I do not know much about them, but this has to be one of my favourite trees for summer in Lahore. In recent years, the authorities had taken to planting imported palms along roads, and recieved much praise and criticism, but more criticism, for failing to think about what a tree in Lahore must do. You see, there is a manual for trees in Lahore that populate the common roads..
Have you been along the Mall Road, known the area before it belonged to a new country called Pakistan? Lahore is yours. Are you a big tree, a tree with a big trunk to make you look like you have always been there, so that no one questions your presence? Do you promise to give shade in the summer to all the poor who rest underneath, and to the cars that whizz by? Would you like the sun should filter in softly through the late afternoon and evening light, and then in winter, preferably be bare and let the warm sun through so all may sit again underneath, and enjoy its warmth? Do you agree to be dense and friendly, and shield the birds and squirrels from human eyes and predators while they hold little concerts and games everyday, and even build their nests amongst your arms? Year after year, being suited to the climate, they must thrive in Lahore, having taken up a Lahori identity, calmly throwing in a little bit of quiet and green into the dust, noise and pollution. The new sleek palms did not offer the shade, nor were they suited to the climate. Each tree, each animal thrives in their climate. Each human would happily thrive in a climate of their choosing, yet, many times I wonder at how we ourselves are the yield to our sowing, and whether we may in our delirium choose the best for ourselves then. I cannot help feel it is sometimes God deciding which climate we are best suited to, and we may discover that after a storm we couldn't withstand to feel our backs nearly breaking, we are still standing, that though we wanted the sun, our roots are taking hold into winter's hard soil. They praise the shrub and the species that thrives in unsuitable conditions. They must not forget the human race that also struggles to take fruitful root where it is planted.